Use CONTINENTAL Professional Boosters as a savoury flavour base or to add more flavour during cooking. As a Liquid Stock, using the serving quantities table as a guide, add desired amount of CONTINENTAL Professional Booster to boiling water and stir. As a Flavour Booster, add desired amount of CONTINENTAL Professional Booster while cooking, to add flavour to a dish. 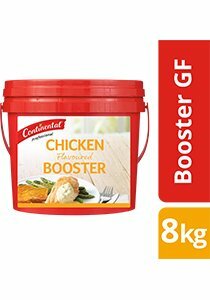 The amount of CONTINENTAL Professional Booster needed will vary according to the level of flavour intensity required. Servings per package - 3200. Serving size - 2.5 g.